I’m not someone to document every little thing I eat but I couldn’t help but take photos at a meal I was served at The Botanist in Birmingham. Yes. That is a shovel. An actual garden shovel. Proving that there is such a thing as taking a theme too far. 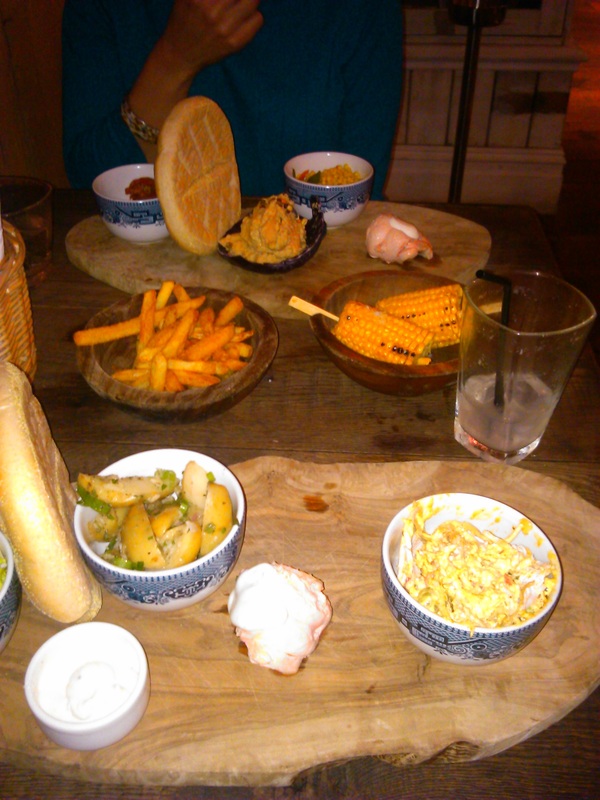 The soup served in a flowerpot shaped mug was fine but an actual garden tool? 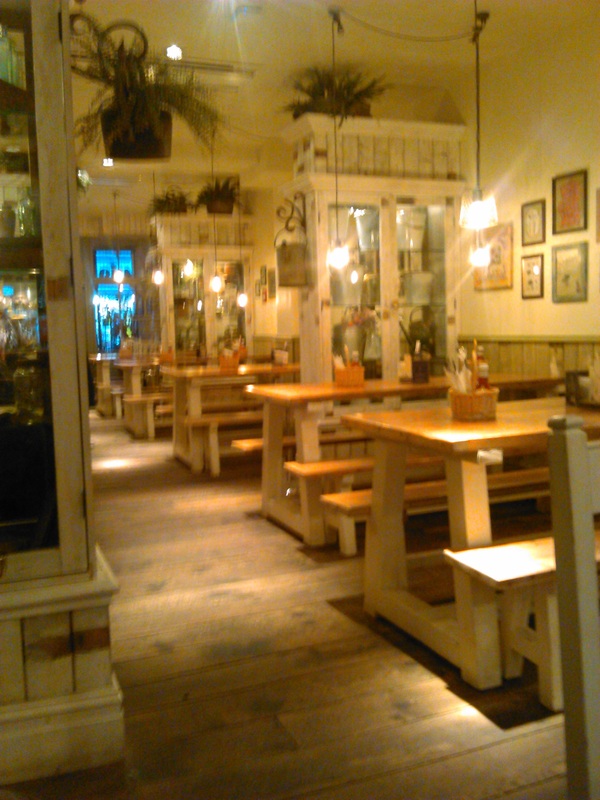 It was my first trip to The Botanist and I’d been looking forward to visiting it since I discovered it a few weeks ago and was struck by the eyecatching wrought iron gates at the front and the inviting terrace. 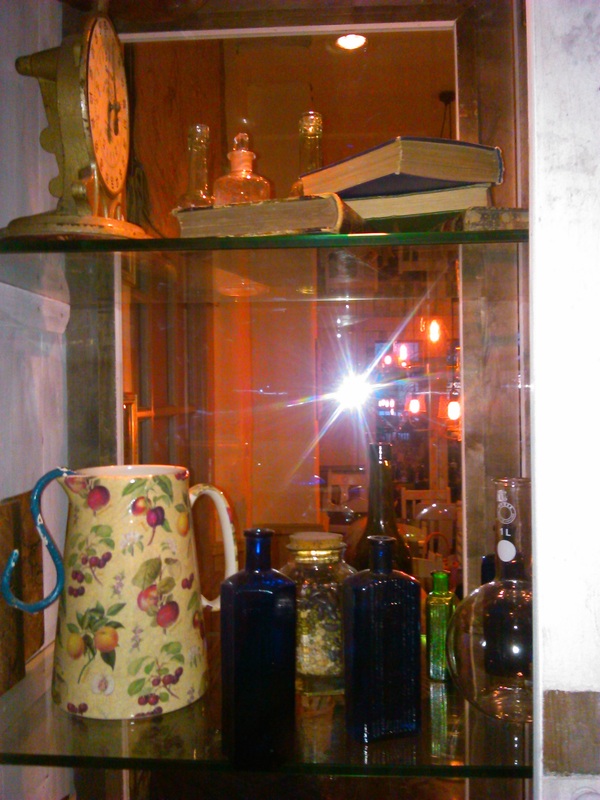 I was instantly smitten with the olde worlde feel of the place and on my visit yesterday I liked it even more. The food wasn’t as fancy as I expected and prices were reasonable though the OTT presentation of some of it made me feel that they were trying a little bit too hard. 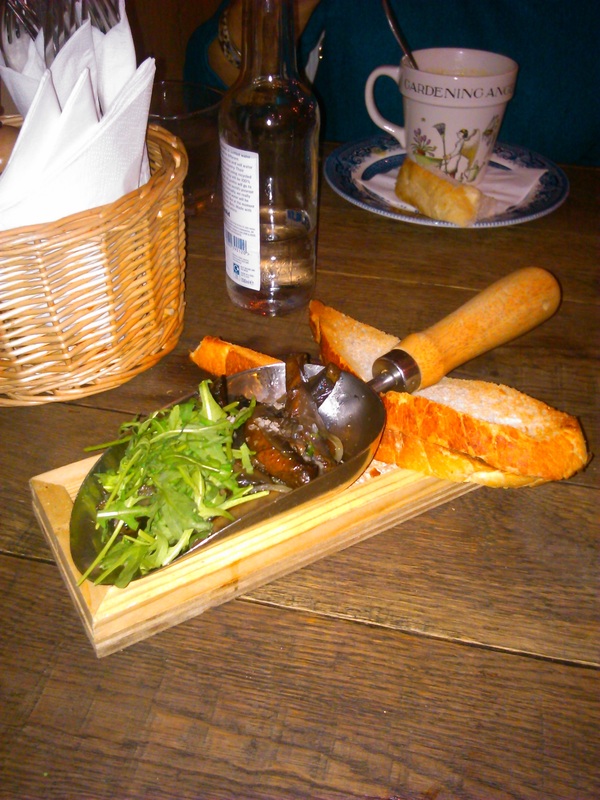 My starter in the shovel- garlic mushrooms- was lovely though the stupid thing kept rocking as I was trying to eat. My main was a selection of four items from a choice of 21, served with freshly baked bread on a wooden slab which was a lot less problematic than the dratted shovel. Would I go back? Definitely. It was a relaxing and charming experience, the staff were very accommodating and friendly without being too saccharine and I loved the interior. However next time I visit, #WeWantPlates. OK I get it now. I’ve been hearing about how fantastic Whole Foods Market is and how all the celebrities are shopping there- blah, blah, blah, yadda, yadda, but now I’ve actually been I understand what all the fuss is about. I went on another expedition to London last weekend with my good friend H who was one of the fuss making people I tried hard to ignore. H kept telling me how great this place is but I really wasn’t buying it. I trust her judgement but I mean- it’s just another food place right? WRONG. First of all let me say that trying to actually get to this place was an adventure all of its own. We had no real idea where it was, we had no address apart from “London” and once we were able to pinpoint its location the closed tube stations, rail engineering works, not knowing the bus routes and the darned rain meant that Whole Foods was under additional pressure to impress me once we got there- if we ever made it. After a long underground ride and what seemed like two hours of walking (in reality it was probably about 20- 30 mins) we fell through the doors, hungry and wet, and even through my raindrop splattered glasses my first thought was- OoooOoo! I instantly felt healthier just being there. The general atmosphere was warm, welcoming and very much “home-baked” which I know is a deliberate marketing ploy but I fell for it hook line and sinker as it all looked so- well…. wholesome. We got there hungry enough to eat a couple of horses so went straight for the restaurant where I was once again all- OooOooOo! There was so much choice! There was at least three times as many different dishes as I’ve ever seen at any all you can eat chinese buffet and I had to lap all the selections twice before I could pick up a container and start choosing my dinner. In the end I had veggie lasagne, garlic mushrooms, fine green beans, brown rice, tofu in some kind of sauce, red onions, mash potato, red peppers and broccoli and it was DELICIOUS. 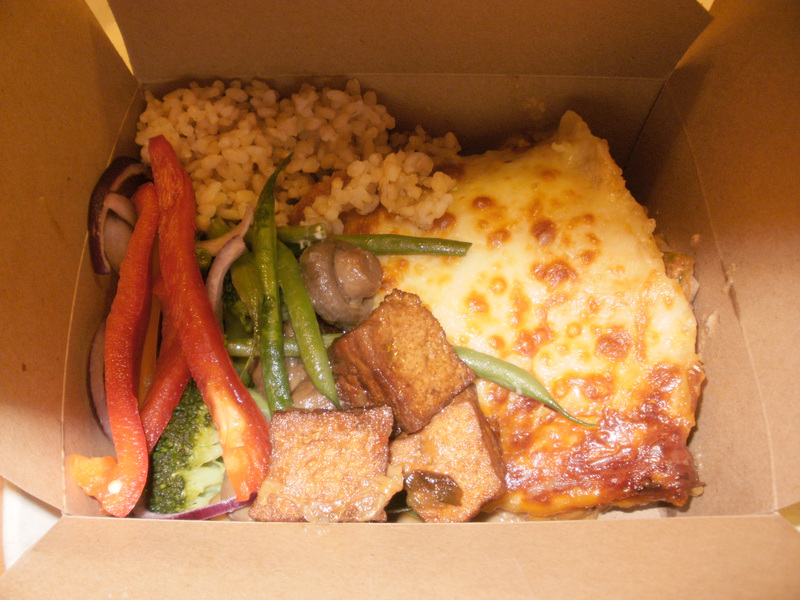 The lasagne especially was dreamy and it comes highly recommended. Unfortunately I didn’t have much time to peruse the actual market as it was late and we had to head home, but next time I’m in London I’ll definitely be going back- especially now I know exactly where it is. Hello my lil custard creams. 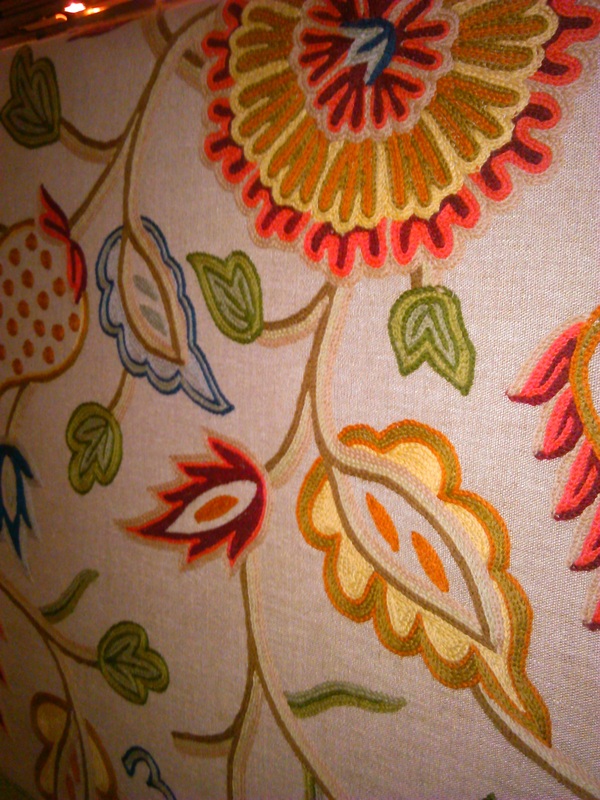 It seems like ages since I sat down to write but the last post wasn’t that long ago. I can hardly believe its almost Feb already, where has the month gone?! The snow that looked like it would be here forever finally disappeared a week or so ago, but its been so wet and miserable I just lost all interest in fashion for a brief moment there. Now that the snow boots are back under the stairs where they belong and the sky is looking a bit clearer I’m starting to get into the new season despite it still being freezing. If you want a FGLNCT fashion hit I’ve written another piece for 100% People which you can read here. 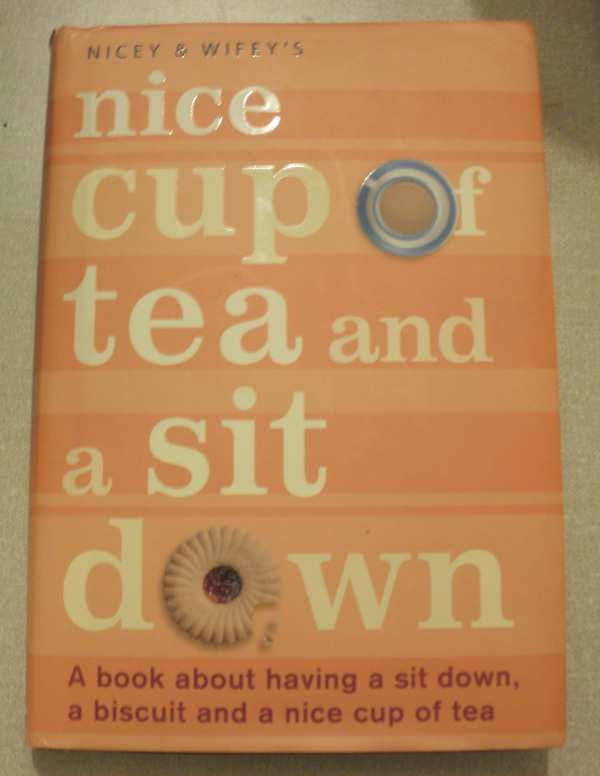 PS- I have biscuits on the brain now since finding this book in a local charity shop today…. A bit bizarre but a pleasant read that makes your mouth water. There’s even a website by the same name. Jam cream anyone? Or at least they try to. I have a new hobby and its the reason I almost missed going to that concert last week- lettuces. How lame is that? I’m thankful my good sense kicked back in when it did because I’m not ready to become someone who turns down fun evenings out to stay in and play Alan Titchmarsh. Just not ready. Some weeks ago BBC Dig Inwere giving away free seeds to people who wanted to start growing their own veg. I love a freebie so despite the fact that I don’t like the vast majority of vegetables I signed up for a seed pack and they arrived about a month ago. I got five packs in total; lollo rossa lettuce, carrots, beetroot, squash and cherry tomatoes. I don’t like beetroot or carrots so I gave those to my dad and some to H (bosom bud who I went to concert with) and set about planting all the others. The squash and tomatoes are being stubborn and hardheaded and refusing to grow more than a half inch per month so I’m pissed off with them and losing interest fast. Instead, I’m focusing on the lettuces who are being much more receptive to my pathetic ministrations and are showing their appreciation by growing nicely. 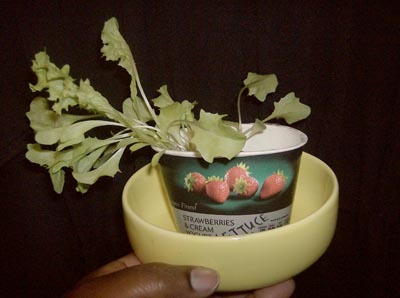 I planted 7 seeds in a yoghurt pot on May 17 and this past weekend each of those seeds got their own spacious home in a flowerpot. 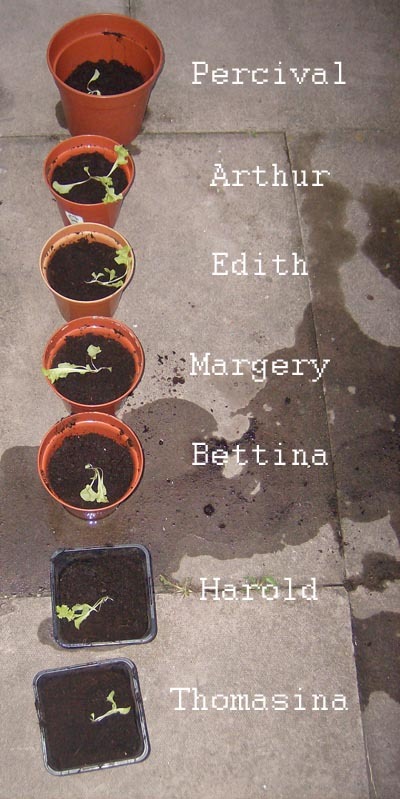 As gardening is sterotypically the pursuit of senor citizens I’ve given them all old fashioned names. I’m also taking a cue from royalty and am hoping that if I talk to them (a la Prince Charles) and treat them all as individuals (!) I will be rewarded with big bouncing fluffy lettuces that taste delicious. I’m getting impatient though as its all taking far too long for my liking. So there you have it- my new hobby. Chilli & Chocolate: One word- HORRID. I couldn’t taste a specific chocolate taste but there was definitely something sweet in there. The chilli flavour was too strong and you could barely taste the potato crisp itself. As I said- horrid. Builder’s Breakfast: I had high hopes for this one as I had heard it was quite impressive the way that Walkers had isolated the taste of each breakfast food (sausage, egg, bacon, tomato) onto different sections of each crisp so each one tastes slightly different. It was a good idea but I didn’t like it. I wouldn’t call it horrid, just nothing special. Cajun Squirrel: What do squirrels taste like? 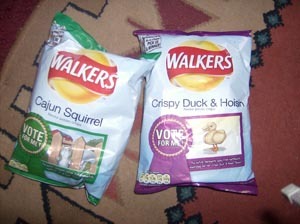 Did someone actually eat a squirrel and try to replicate the taste for this flavour? I doubt it but I like the thought of someone being so antagonised by the pesky squirrels in their garden that they have exacted a metaphoric revenge by imagining them on their dinner plate, smothered in a Cajun flavour seasoning. Or maybe the person who submitted this flavour is a real squirrel lover and wanted to pay homage to his or her furry friends by dedicating a crisp flavour in their honour. Either way, its an inspired idea and they taste great. Onion Bhaji: Flavour was OK but I prefer the taste of onion bhaji on actual onion bhajis. Fish & Chips: YUK!!!! Of all the flavours I would have thought this would be the easiest one to get right. I mean- you have the potato already there, you just have to add a bit of vinegar and a slight fish flavouring, non? Well it was nasty. It was more like Fish & Fish and was the vilest of the lot.. It was a close call as I also like the Cajun Squirrel variety but this gets my vote as I LOVE hoisin sauce and use it on all meats- yes, I like it that much.